Who is this handsome young man? 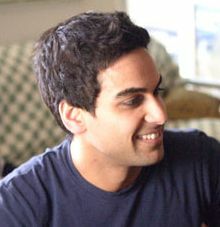 His name is Yogesh Chotalia and he is an up-and-coming Canadian actor from the Toronto area. Why do I have a photo of him up here? Well, back in June 2006, I reported that the Canadian TV show ReGenesis would be introducing a new minor character based on yours truly. At the time, I was told the character would be an epidemiologist named, appropriately, “Dr. Deonandan”, and that she would be a super-hot uber-babe. I rightly wondered if there was a special psychological diagnosis for someone who is physically attracted to his own fictional portrayal on TV. Well, “Dr. Deonandan” was morphed back into a male character, and his profession was shifted from epidemiologist to infectious disease doctor. And he is no longer based just on me, but also on a friend of the creator, named “Atul”. Hence, the character’s name is “Dr. Atul Deonandan”. And he is played by the able and charming Yogesh Chotalia. Now the embarrassing part: “Dr. Deonandan” has about a minute of total air time. If you blink, you’ll miss him. And he’s not called by name at any point during the show. That bit of info is only available in the credits. Hey, how many TV characters are named after you? So stop laughing. Ray R. sends us this great series of videos on how to save time. Mischa sends us this and this, indicating that Al Gore –despite my predictions of the past 6 years– will not be running for President. Well, in for a penny, in for a pound. I stick by my prediction. Helping me along is the news that Gore has just won the Nobel Peace Prize. The time is ripe, Al. The time is ripe. My latest MicroSoft column is up and available here. Spidey Patel sends us this news that Harry Potter creator JK Rowling is suing a group in India for having created a model of Hogwarts School for use in some sort of festival, without getting permission from her or Warner Brothers first. Bad bad Rowling. If these folks are not getting any commercial gain from their big model, why crush so many dreams? It’s not like you would have milked much money out of this set of poor Indians with your books and films, is it? Very very sad. Sarah M. sends us this survey of homosexual comic book characters…. and their fates! And we wonder why Batman and Robin keep their relationship a secret! I’m selling more crap on Ebay. Check ’em out by clicking “Auctions” on the menu to the left, or by clicking here.